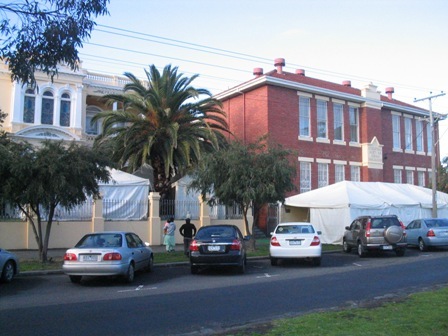 I’m back at the Hare Krishna Temple in Albert Park, otherwise known as Melbourne Mahaprabhu Mandir, my favourite place to celebrate Sri Krishna Janmastami (the Birthday of Lord Krishna) which falls tomorrow. I flew in this afternoon, and it’s already a hive of devotional activity. You can’t see them all, but there’s a number of tents on the roadside out the front. They are just for guests shoe storage. Inside there are many other tents for meal distribution, a dosa-making tent, and many more. 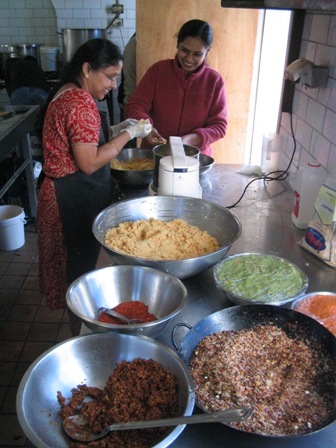 These ladies are preparing a South Indian selection for offering to Krishna tomorrow on one his innumerable feast plates. There’s toor dal pakora, dosa mix and a number of chutneys in the photo above. 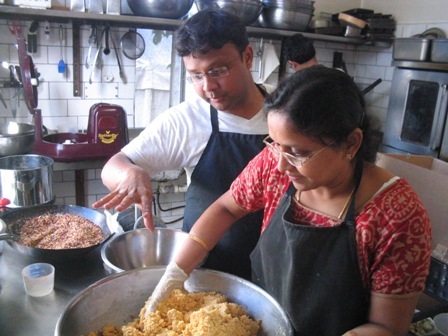 A devotee cook assists his mother in grinding toor dal. We’re expecting 10,000 guests tomorrow, so there’s a lot of cooking, vegetable chopping and flower garland making in the huge tents erected on the property. These gentlemen are commencing the cut up for 750kg potatoes. A fresh dania patta cutting marathon! (none other than fresh coriander leaves). There’s many boxes of fresh coriander to go. 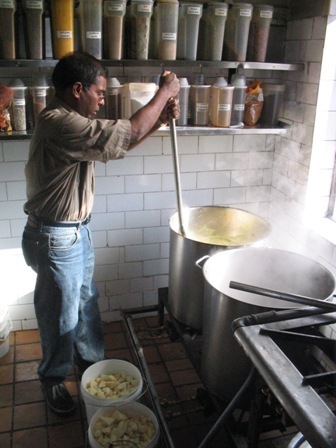 Sweets cook extraordinaire Brajabasi has made a huge batch of fresh panir cheese to be brayed and rolled into balls, before simmering in sugar syrup to make the famous rasagulla.